You'll be £19.99 closer to your next £10.00 credit when you purchase Conquerors of the Roman Empire: The Franks. What's this? Order within the next 6 hours, 45 minutes to get your order processed the next working day! Simon MacDowall examines how this relatively small group of Germans came to be overlords of all of the former Roman province of Gaul, giving their name to France in the process. From their earliest incursions into the Empire, down to the Battle of Casilinum (554), their last battle against Romans, he studies the Frankish way of warfare and assesses its effectiveness. The size and composition of their armies, their weapons (including the characteristic Francisca axe), equipment and tactics are discussed. 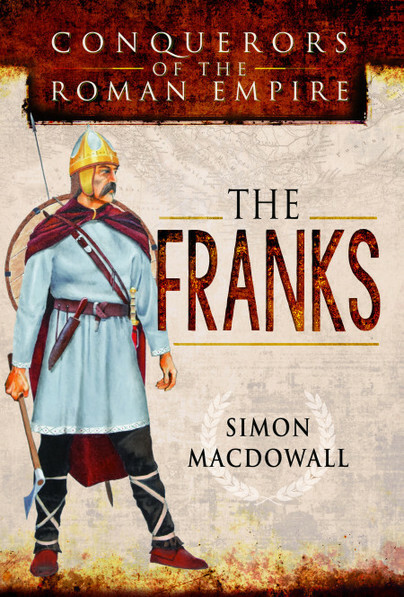 In this tumultuous period, the Franks had a complex relationship with the Romans, being by turns invaders, recruits to the legions and independent allies. Accordingly, this book also covers the Franks’ role in defending the Rhine frontier against subsequent invasions by the Vandals, Alans, Suebi and the Huns. Their success in defending their new homeland against all comers allowed them, under the leadership of the Merovingian dynasty of Clovis, to establish the Frankish kingdom as one of the most enduring of the ‘barbarian’ successors to the power of Rome. For anyone is interested in the late Roman, early medieval period, this book is a great read, I found it is easy but very informative read. The maps and chronologies where fantastic and I can see myself referring to them again and again. Not one for the casual readers but for students of Rome an interesting look at how the Franks filled the power vacuum that Rome left behind. Simon MacDowall was born in England but from the age of 10 grew up in Canada. He joined the Canadian army, was commissioned into the Royal Canadian Dragoons and saw active service with the UN in Honduras and Nicuragua and with NATO in Croatia, Bosnia and Kosovo. In 1994 he was the UN spokesman in Sarajevo. He later worked for NATO as a civilian before joining the UK civil service, where he was the Communications Director for several departments, including the MOD and HMRC. In his spare time he is a keen wargamer and military historian, with six previous books to his name.